Composite image of the galaxy cluster Abell 2744, also known as Pandora's Cluster, taken by the Hubble and Chandra space telescopes and the Very Large Telescope in Chile. 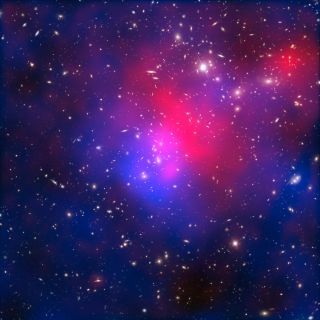 Hot intracluster gas is shown in pink, and the blue overlay maps the location of dark matter. Albert Einstein wins again. His general theory of relativity has proved accurate in predicting how light travels from some of the most distant galaxy clusters in the universe, according to new measurements. However, the findings still do not disprove an alternative theory of gravity invented to undo the need for dark energy, which is thought to be causing the accelerated expansion of the universe.